Every now and then, I do a little search around a few places to find out what people want to read about, or what people are looking for, and I try to fill in the gap with some useful information. 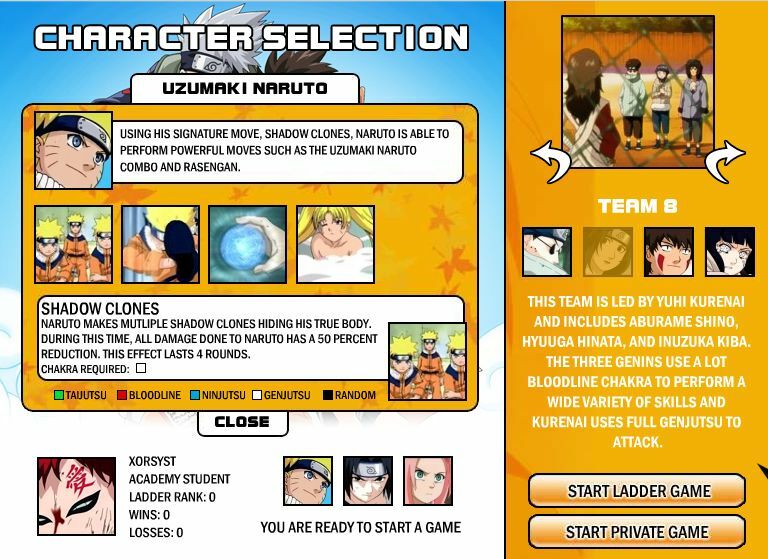 With Naruto being such a popular Anime here in the states and all over the world, many people are looking to pass the time with online Naruto games, so I thought I would scour the web and find some of the games worth your time. 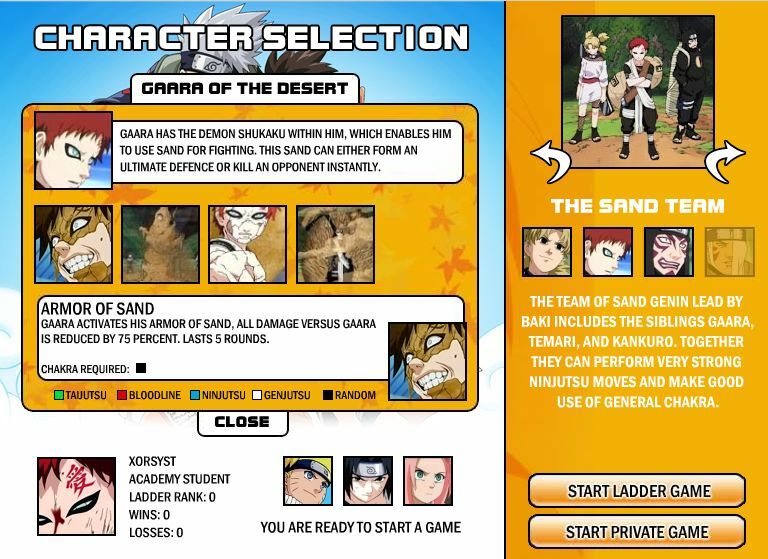 Now if you have ever tried searching for Naruto online games, you are sure to have come across Naruto Arena. It’s probably the biggest online Naruto game out there. Just looking at their front page, they have a little blog to the right and each post has over 400 comments. So the site gets some heavy traffic for sure. Naruto Arena starts out as a 3 vs 3 match that puts you and 3 of your characters against another human player with his or her 3 characters. Each character gets a total of 100 hitpoints. And like the Anime, you perform skill based moves like stuns, blocks, or special moves. You are limited by the amount of chakra the move uses so you must use strategy and good tactics to win. Skills are even separated into different bloodline chakra. So you will use Sasuke’s bloodline, the Sharingan, in Naruto Arena. Naruto Arena almost all of the characters from the original anime. Sorry, you wont see any of the Naruto Shippuden versions here. All of your favorites form Konoha are here including: Uzumaki Naruto, Haruno Sakura, Uchiha Sasuke, Shiro Haku, Rock Lee, Tenten, Hyuuga Neji,Inuzuka Kiba, Hyuuga Hinata, Aburame Shino, Akimichi Chouji, Nara Shikamaru, Yamanako Ino, Maito Gai, Hatake Kakashi, and almost everyone else. The game scores some points for their character selection. Many of the characters from the Chuunin exam series are also included. So with 46 characters to choose from, you will have very unique teams. 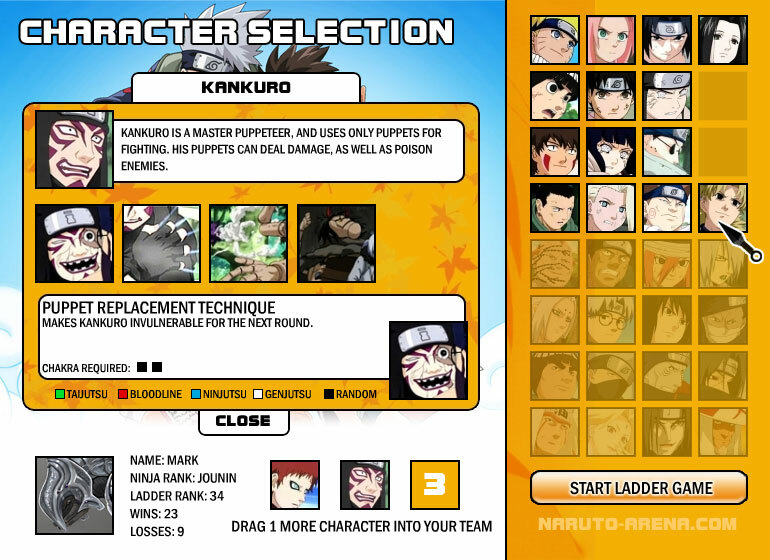 However, I’m sure you will also see the classic NSS (Naruto, Sakura, and Sasuke) combo chosen a lot. The game is a classic turn based web game and not like the Nintendo Wii title Naruto: Clash of Ninja Revolution. You have 60 seconds to complete your turn, but that seems to be more than enough time unless you are a deep thinker and strategist. One of the reasons I believe this game is so popular is that Naruto Arena has an active and competitive ranking ladder. There is an overall top 10 ranking, top 10 most wins, and the top 10 winning streaks. So if you’re anything like me, and have to be the best at everything you do, good luck. There seems to be some dedicated players playing this online game! They even break the players down by country because Naruto Arena has such a large player-base from all over the world. Another nice thing about Naruto Arena is that when you want to take a break from competing, you can always check out their online forums and chat rooms to meet your fellow ninja in a relaxing environment. Learn strategy from fellow players as well as to discuss the latest Naruto anime and manga. The game admins are always tweaking balance to provide the most enjoyment for everyone. Sometimes the nerf stick is for the best you know? So overall I would definetly recommend checking out Naruto Arena if you are looking for online Naruto games. Mario Kart Wii: Japanese screens and more!